I posted a video over the weekend in which I ramble in many different directions. 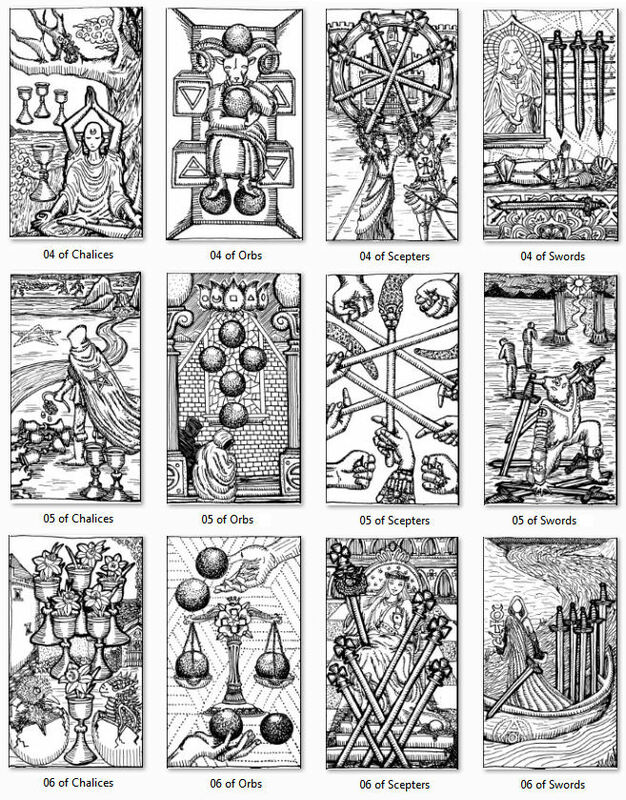 It was supposed to be a video in which I introduce you to the black and white line drawings of the Major Arcana from the Spirit Keeper’s Tarot, which are now available for your free download. It was also supposed to be me making a case for undertaking a ritualized process of coloring in the black and white line drawings. And instead, I went off on a tangent about God, the Devil, my lifelong love of art, and the role of religion in occult study. I do at a couple points keep to topic and mention the tarot deck and coloring in a tarot deck, but I’m afraid most of it is just a winding road of rambles. Yes, you can tell I’ve cut and edited the clips because the original rambling was even longer, which all but turned into an unfiltered incoherent video diary of what I did for each Key. When I went to edit the video clips, I thought, yeah, I’m not going to post a one hour video, so I literally cut about half of the footage. Hence the noticeable heavy-handed cutting here. Don’t worry, I promise you, you’re not missing out: the cut ramblings were very boring. Original pen and ink art on white heavyweight cardstock, 100 lb. cover (270 gsm) at 8.5″ x 11″, so I draw three cards per sheet. I’m now at work on the Minors, but it’s going to take a lot longer to complete than what it took for the Majors, because I need to return my focus to other projects in the pipeline, both professional and personal. For the Majors, I worked on them pretty much during every single millisecond of non-day-job-work time I had for sixteen days (new moon in Gemini to the full moon in Capricorn). I won’t be able to commit that full-force on the Minors, so the time allotted for the Minors will need to be distributed out more evenly and in a more balanced way with my regular schedule. Like I did with the Majors, my process for the Minors is to first read Mathers, Papus, Waite, and Crowley, find the common denominator (not easy at all; really struggled with this), then factor in my point of view, philosophy of life, and how I’m sensing that common denominator energy in today’s collective unconscious, and then depicting that personalized and updated extrapolation, all while attempting to keep with that medieval grimoire woodblock print art style. I’m also looking at how the numbered pip in the Minors relates back to its corresponding numerical Key in the Majors. I’m also taking in to consideration the decans in the Minors and how they relate to the corresponding planetary and zodiac cards in the Majors. So it’s a pretty laborious process. As I explained in the video, I’m starting on the pips with the Fours, then moving on to the Fives, up to the Tens, then after Ten, the Aces, then Twos, and ending the pip work on the Threes. Then it’s the courts, which will be the directional guardians of the spirit realms I’ve constructed. I’m also trying to tell a story– many stories– a web of stories. So laterally, all the Fives need to express a narrative, but vertically, the Four of Scepters to the Five, to the Six of Scepters need to tell another narrative. So there are lateral and vertical story arcs. The single born fruit at the foot of the figure in the Six of Scepters (Six of Wands) is from the Tree of Knowledge in Key 6. 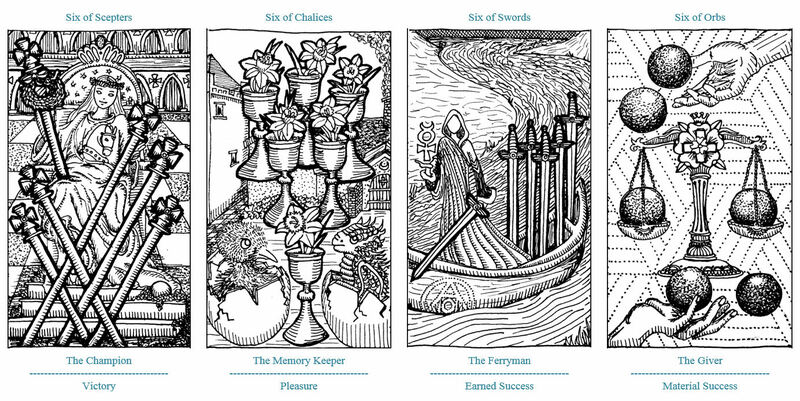 Also note the storyline from the Six of Chalices here to Key 6 and even on to Key 15. Once the pen and ink line drawings of all 78 cards are done, I’ll go back in with colored marker brushes to fill the images via pointilism. Again- in the video I explain the metaphysical reasoning for opting to go with pointilism. Benebell you’re like, kind of, like amazing. I can talk like that being from CA. Seriously though I really like going on a bit of your process/journey. This is quite a privilege. 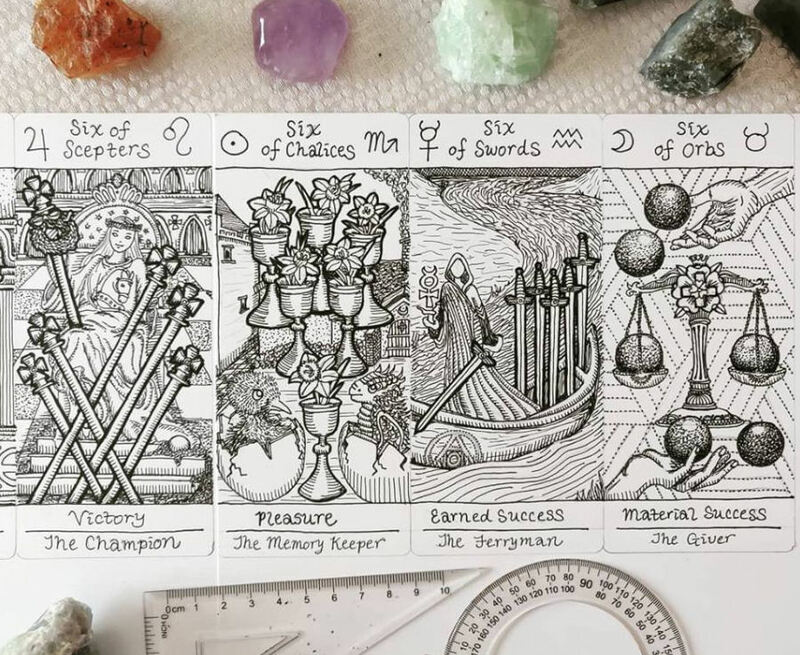 I love the majors and will be working with them via your manual; I think this is going to be an absolutely exquisite deck for inner work and I feel so privileged that you shared it with us! It’s fascinating to read about your creation process, too. Very nice and thorough !!! I’m left hand and consider it a wonderful unique strength !!! Oh nice! Yes, I agree that being left-handed is a wonderful, unique strength! Thank you so much for sharing this!! Honestly soooo cool. I can’t wait to dive into this process. Meet you behind the veil. Hey Morgan! I don’t think the MPC printed cards will color well unless you are using some really expensive high-end top-of-the-line permanent superfine markers. Basically, the coloring instrument you have would need to replicate the ink printing on such canvas that would occur when machine printed. But the MPC printed cards would be good if you just want a set in the original black and white. I would insist that, whenever possible, home-print and manually do the double-sided alignment thing because it’s the easiest way to control production value. If you have one of those printers where you can feed one paper through at a time, it should be able to take heavy cardstock that’s similar in thickness to mass-produced tarot cards we’re used to. Thanks! Your advice just saved me a lot of frustration! I will attempt the home print first.